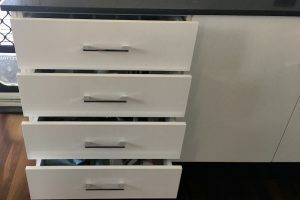 What is the current state of your kitchen cabinets? Truthfully now – do you enjoy a tidy, spacious and well-organised kitchen that’s quite simply a pleasure to be in? Or is your kitchen submersed in a state of chaos and confusion that you avoid at all costs? It’s safe to say that when navigating your kitchen is an unpleasant activity, now is the time to make a change! Kitchen cabinets are extremely handy – without them, where else would you frantically hide the culinary clutter before visitors arrive? Unfortunately, when they’re dirty, untidy and jam-packed with junk, using your kitchen quickly becomes an unwelcome experience. What’s Living In Your Kitchen Cabinets? This can be a tough question to answer when you can’t see past the first few items in any of your kitchen cabinets! Taking the time to organise this space provides a fantastic opportunity to inventory your kitchen stock. You may discover equipment, cutlery, utensils, and food items that you had entirely forgotten. Consequently, there’s a distinct possibility that you’re in possession of a variety of duplicates – or is your ownership of three cheese graters deliberate? When you remove everything from the kitchen cabinets so as to give them a proper clean, you may need more spray’n’wipe than anticipated. Your cupboards may be ‘alive’, thanks to accidental food spills and leakages in a warm / damp environment – the perfect conditions for mould to flourish. Especially in those dark and awkward corners that always manage to escape the occasional cursory wipe-down. Vanishing this unwanted tenant is an important part of maintaining good health and hygiene in your home. Despite the uncomfortable side of housekeeping, cleanliness is indeed next to godliness, and a sparkling clean kitchen is no exception. Not to mention the immense satisfaction of finally checking that chore off your household to-do list! The ancient art and science of feng shui teaches how to use and arrange your space to effect the greatest level of health, wellbeing and prosperity. Feng shui considers the kitchen to be the most important room as the heart of the household which provides the nourishment of life. The practice of feng shui dates back over 6,000 years in Chinese culture, and is becoming increasingly renown and utilised in the western world. An example of this is Marie Kondo, bestselling author of “Tidying Up With Marie Kondo” and creator of the KonMari Method. Inspired by feng shui, the popularity of her teachings with audiences around the world makes it clear that she’s on to something! Having a tidy and well-organised home (your kitchen cabinets included) can bring increased joy in life as part of the practice of mindfulness and introspection. Last but not least, if a kitchen renovation is on the cards, clearing out your kitchen cabinets is the perfect preparation. Not only will it make moving into your new kitchen much easier, but it also gives you the chance to let go of any kitchen clutter that you no longer need. Instead of throwing things out, you can donate the unwanted items to your local goodwill store where they can be reused and recycled. If a kitchen renovation has been on your wishlist forever, Express Kitchens Brisbane have the solution you need! Our kitchens are custom designed to fit your available space, and are built in our local Brendale factory. With more than 2 decades of industry experience, we have honed our craft in order to provide superior quality at affordable prices. We also believe that convenience is absolutely essential, hence our 1-day installation policy. To learn more about how Express Kitchens can help turn your dream kitchen into a reality, contact us today on 1800 675 605 to book your free consultation. So you’ve just opened your favourite home renovation magazine, and are flicking through the modern kitchen makeovers section for inspiration. Perhaps you’ve been looking at getting your kitchen renovated for some time, but you’re not sure what style or design will best suit your space. Perhaps you have a design in mind, but are not sure what kitchen renovation company to go with. Whatever the case, we’ve broken down some of the key things to look for when it comes to modern kitchen makeovers, so you can get the dream kitchen you’ve always wanted! One of the major rules when it comes to modern kitchen makeovers is to keep the design consistent with the rest of your home. For example, if you’re living in a Queenslander style home with dark wood floorboards, then chances are you’re not going to want to go with a sleek design that won’t suit the look and feel of the rest of your home. You may opt for a modern design still, but one that utilises more natural components, such as natural looking tiles or glass, stone bench tops, stainless steel appliances and cream walls to offset the dark flooring in other parts of the house, as an example. If your home is spacious and airy, you want your kitchen to feel spacious and airy as well. 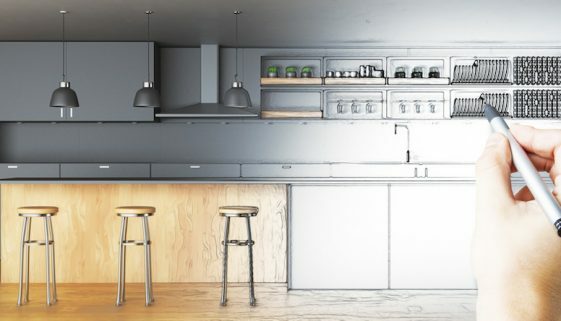 If your home has a sleek, clean inner-city feel, you’ll want your kitchen to emanate this aesthetic. All of this is especially important to consider if you plan to sell your home at any point in the future. You want to be sure that the time and money spent on modern kitchen makeovers is going to maximise the value of your property and appeal to potential buyers long-term. Yes, aesthetic is very important when it comes to modern kitchen makeovers, but so is functional design. In fact, too many people emphasise the aesthetic, and forget about making the kitchen practical! Remember, the kitchen is the heart of the home. When done right, you can get the best of both worlds; a sleek, modern looking kitchen that has the right aesthetic appeal, and is also completely functional. We always recommend consulting an expert when it comes to the design and layout for modern kitchen makeovers. Why? 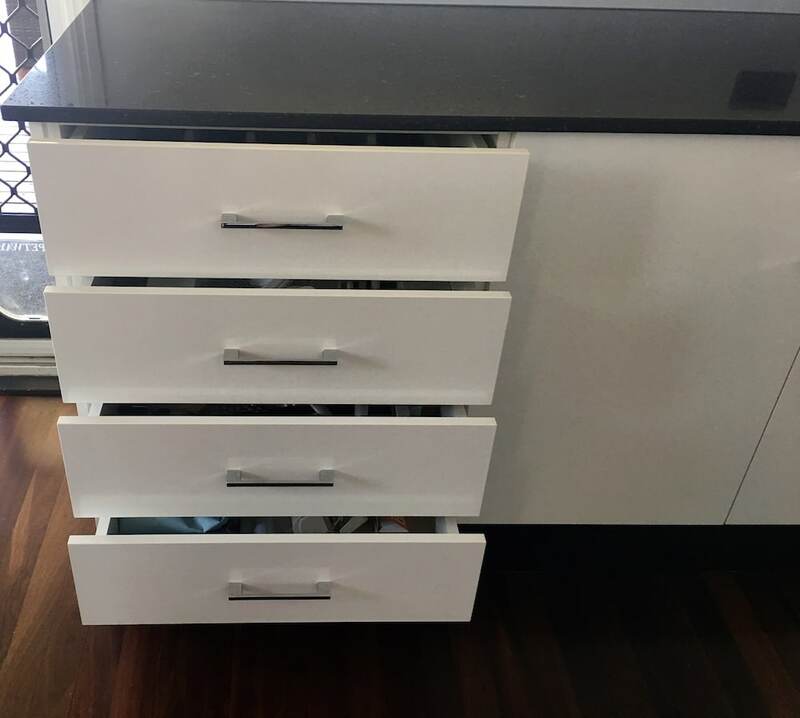 Quite simply, an experienced designer can flag potential problem areas you may have overlooked, such as where the fridge is located, the height of the benchtops, where the cabinetry is located, or how ventilation is flowing. Without the use of licensed, experienced professionals – you risk making major mistakes that could potentially cost you more time and money in fixer uppers long-term. When you choose an experienced, licensed professional to work with, you know you’re fully covered for workmanship and the various moving parts. Looking to consult an experienced, professional designer on modern kitchen makeovers? 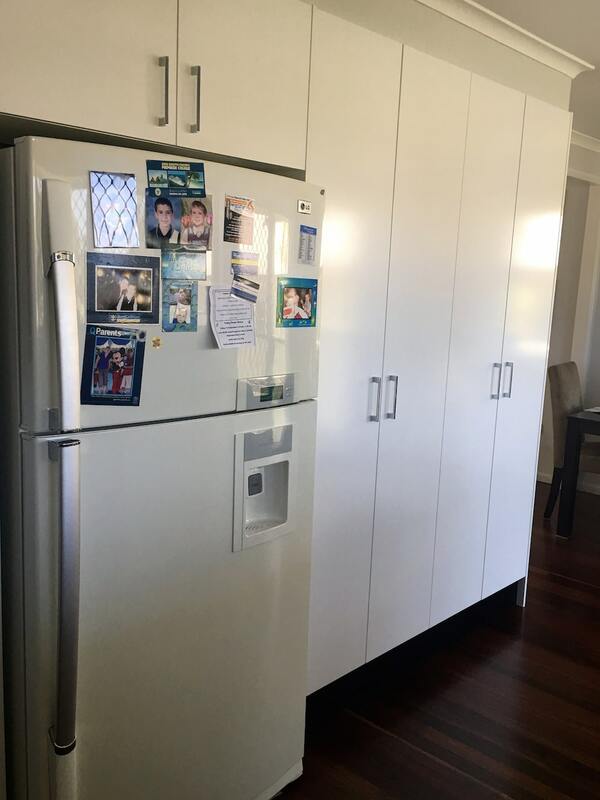 Express Kitchens specialises in transforming Brisbane kitchens from old and outdated, to modern and functional – all done quickly (see our signature 1-Day Installation service) and cost-effectively (interest free finance available) to ensure you get the modern kitchen makeover you desire. We offer complimentary, no obligation consultations with one of our qualified kitchen designers. To book your Free session, simply submit an enquiry online. Calling All Brisbane Northside Kitchens – It’s Your Time To Impress! It’s Your Time To Impress! For many of us, our kitchen is our haven! The kitchen is arguably the room in the house that sees the most activity – for singles, couples, and families alike. Whether yours is one of the south Sydney, northern Cairns, or Brisbane northside kitchens, we all want our kitchen to be a spacious and flowing place that feels good. No tripping over the dishwasher, or having to constantly sidestep family members to get to your coffee machine! 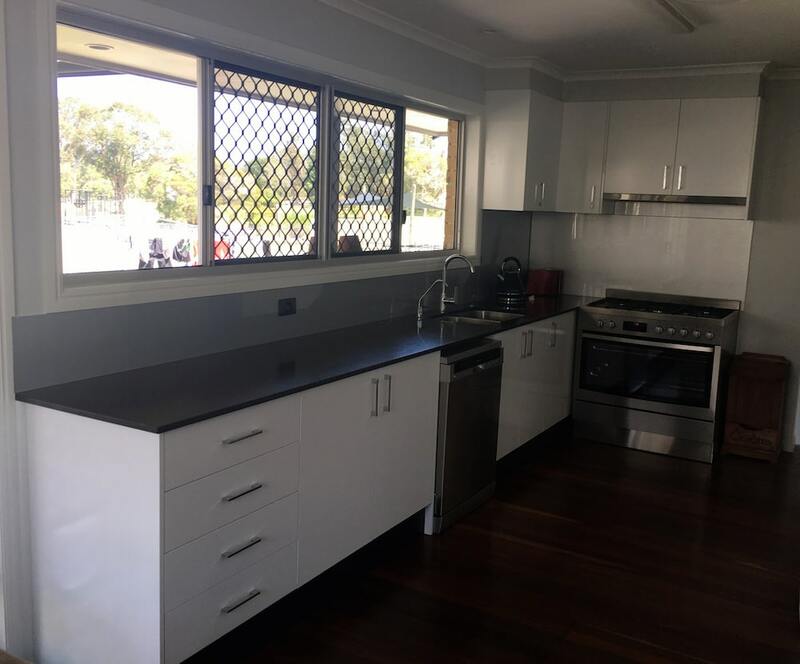 If you’re a Queenslander with your dream kitchen in mind, lucky you – you can sit back and relax while many others do battle with their kitchens daily. 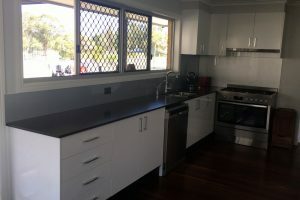 Any Brisbane northside kitchens that are in sad need of a renovation, you’ll probably have intimate experience with some of the problems we cover in this article. With increased numbers of immigrants and baby boomers, Brisbane experienced a growth spurt from the late 1940s – 1950s. Many houses were built during this time, dictating the style and layout for kitchens throughout Brisbane and other areas as the city limits stretched outwards. 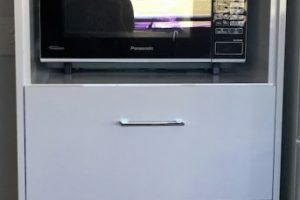 So, unless your kitchen has been renovated in the last decade, it’s any wonder it may no longer be meeting the needs and lifestyle of today’s hectic living standards. Some of the less appealing styles over the years include small kitchen spaces tucked away from living areas, with poky cupboards and interesting wallpaper to say the least. Or perhaps you get to enjoy faded linoleum with “funky” patterns that remind you of when you were a kid? While everybody loves a good fancy dress party, and retro is always a fun theme – when it comes to our kitchens, we want sleek and modern. Let’s be honest, if your Brisbane northside kitchens look like you’re stuck in a time warp from the “swinging 60s” – a new kitchen is just what the doctor ordered. There’s Just Not Enough Space! Thanks to the joys of technology, we all love our gadgets that make culinary life a breeze. Just one problem – space! 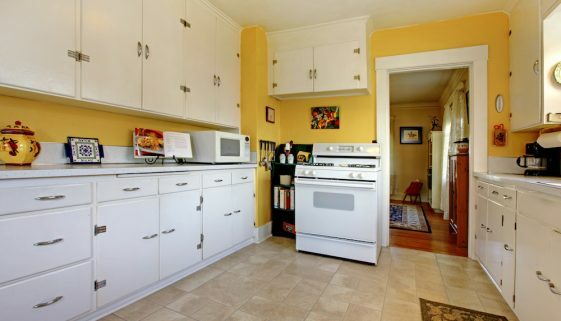 If you’re suffering from a kitchen that is cramped and poorly designed, you’re kitchen is probably hopelessly cluttered. Do you dare to dream of the day you can fit your blender, coffee machine, food processor, and toaster seamlessly on the bench all at the same time? Do you find yourself daydreaming of a kitchen where you have enough space for your food, crockery, cutlery, and cooking implements? If the thought of cleaning awkward-to-reach storage cupboards brings you to tears, it’s time for a kitchen remodel! Is there anything more frustrating than a kitchen with a terrible workflow? It’s a ‘real’ dilemma for some of us who have to traipse back and forth around the kitchen just to get from the sink to the prep bench, then back to the oven. Not to mention having to squeeze past others in the kitchen thanks to narrow walkways and an inefficient layout. 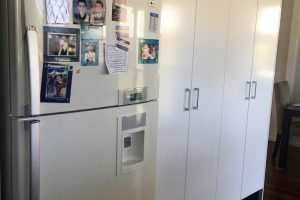 Even in small houses, a kitchen can be well-designed to perfectly fit the space available – and Brisbane northside kitchens can be designed this way, no exception. Perhaps it means knocking out the wall between the kitchen / living room, putting in an island bench, or changing the style of your storage cupboards. There are numerous ways that layout can be adjusted to create a kitchen with maximum flow, convenience and space. A fabulous kitchen that you love doesn’t have to be a distant dream – you’ll be amazed at what an improved design and skilled renovation can achieve! For all the weary souls frustrated by their Brisbane northside kitchens and ready to experience the kitchen of their dreams, get in touch with us today for a free renovation consultation. We’ll tell you everything you need to know about our customised design kitchens – from the 3D design technology used by our professional designers, to the express 1-day kitchen installation, and interest finance available for maximum convenience. For centuries, the kitchen has long been considered the gathering room of the home. It’s where food is prepared, and often where food is served. For most households, it’s a room that is used every day, serving as a meeting place for families. So, it’s only natural that you may be thinking about kitchen renovations Brisbane, and surrounds, to help create your dream kitchen – combining both style and functionality. We understand however, that when it comes to making the right choice for your kitchen renovation, there are a lot of factors to consider. In this article we’ve compiled three helpful tips to consider before getting started on creating your dream kitchen. While their are plenty of generic flat pack kitchen renovation options, we always recommend consulting a professional first. Getting the right layout and design that’s specifically customised for your space is crucial in actually allowing you to achieve the right look, feel and practicality you’re looking for. An experienced kitchen designer can suggest layout changes that instantly make a kitchen look more spacious, stylish and practical. We know the DIY option for Brisbane kitchen renovations can be quite tempting to save on a few dollars. Especially with the popularity of home improvement and DIY shows, it makes it seem quite easy! The problem is there are often hidden factors that are not discovered until you are half way through the process – ones that only experienced professionals know how to deal with. This might have to do with your particular flooring, walls, piping, and other “unknown” factors. Bursts, leaks, and rotting are also problems that may show up down the track – requiring patch up jobs long-term. 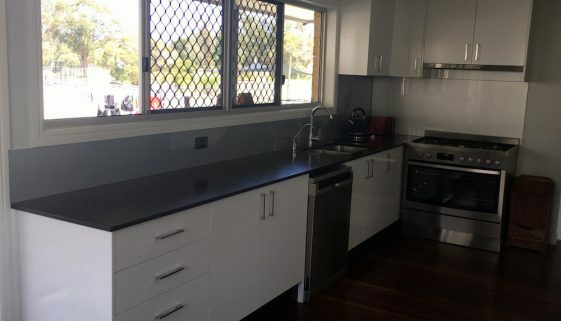 Investing in professional experts who specialise in quality kitchen renovations Brisbane may cost a little more upfront, but will likely save you time and money down the track. Plus, well established kitchen and laundry cabinet suppliers can offer finance options to helps make the financial investment more doable. Remember, it always pays to invest in quality, professional solutions. A big factor to consider when it comes to kitchen renovations Brisbane is the time and inconvenience of actually getting the renovation done. 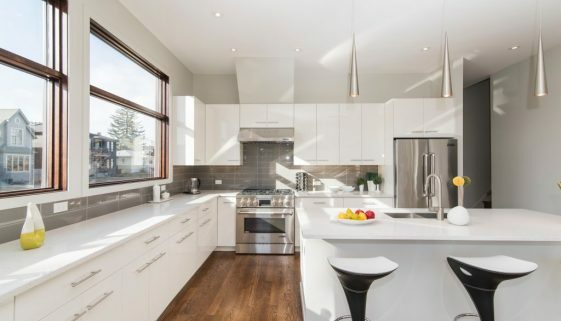 Lengthy kitchen renovations might mean you’re without a functional kitchen for a period of time, with tradespeople coming and going from your home. With this being said, it’s possible to get your Brisbane kitchen renovations done express without sacrificing on quality. The quicker you can get your new cabinets and appliances in, the less time you need to spend without a functional kitchen. And there you have it. 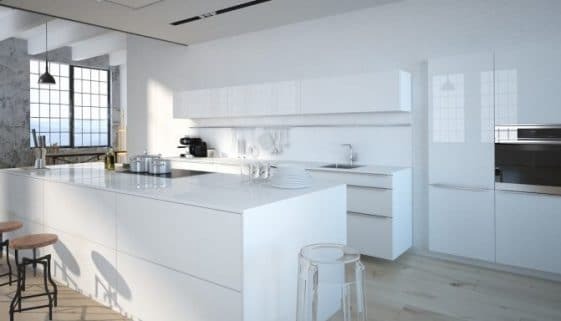 Three tips to consider when searching for the perfect kitchen renovations Brisbane – that will help you achieve the dream kitchen renovation you are after. To find out more about our express, customised kitchen renovation offerings, you can contact us today to book in a free kitchen renovation consultation.